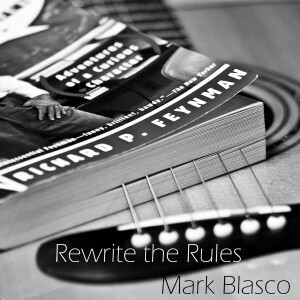 For the May Bushwick Book Club show, I wrote two songs based off of the book “Surely You’re Joking, Mr. Feynman!”. Recently I had some time, and recorded the slower of the two songs. This was inspired by the end chapter, where Feynman encourages all scientists to admit to their failures, and not to lie to themselves. It also takes some inspiration from his first wife, who died while he was working on the atomic bomb. This is a produced version with drums, guitar, keyboards, bass, and a few layers of vocals. Now, for those of you who have been coming to my website in the past to download songs, you’ll notice that this time around I haven’t included a download link to the mp3 file . Instead, I’ve decided that if I’m going to start being serious about calling this endeavor a “music business”, I need to put a little more emphasis on the “business” part. So, I’m trying something new this time around, and making the download available to purchase. For the low, low price of just $0.99 (or more, if you are feeling generous), you could be the proud owner of a brand new, shiny, never been off the lot, still has the dealer tags on it, straight from the factory mp3! (or, if you prefer, flac, or one of several other formats that most people have never heard of). For those of you who are saying “I don’t trust this internet thing with my money”, or “music isn’t art if it isn’t free”, or “I need to save my money for my next botox treatment”, let me know, and I’ll be happy to send you the song in exchange for some good vibes (either the spiritual kind of the musical instrument kind, you’re choice). If any of you out there have better suggestions for ways to sell and distribute music, please let me know, as this is a new venture for me, and I’m open to any ideas. This entry was posted in Music and tagged Bushwick, Music, News. Bookmark the permalink.